Duncan Kidd’s adaptation transformed Shakespeare’s tragedy in a comedy. A theatre company specialized in Forum Theatre – a form of theatre focusing on the interaction with the audience in spite of traditional staging – offers a very personal interpretation of Shakespeare’s Coriolanus. However, not everybody agrees on this peculiar staging: the latest member of the company, the actor who plays Coriolanus, doesn’t appreciate the artistic choices of the others and he struggles to fit into the group. The story of the theatre company mirrors Shakespeare’s story where Coriolanus as well can’t find his place in a community he fought for and that wants to represent as a Consul. Duncan Kidd created a story in the story where, with irony and sarcasm, he approached issues such as bullying, integration in a group and the need to be liked and accepted by people. Moments of interaction with the audience are followed by comic and exhilarating sketches where the actors tell their version of the story, overlapping the characters of the tragedy. Each situation mirroring Shakespeare’s story, highlights important issues and gets a smile out of the audience. While enjoying the comedy in the story the spectators could as well take a moment to think: what happens when someone can’t fit into the group? What if people don’t accept as for what we are? The paly is a retelling of William Shakespeare’s “Coriolanus” in a simple and physical way. This is an introduction to the language of The Bard through looking at the key scenes and speeches of the original. Focussing on Coriolanus’ three key conflicts – his relationship with his mother, his enemy Aufidius, and the people of Rome, i.e. us the audience – becomes clear how the same story can be told in different ways. The audience will have the opportunity to listen to Shakespeare’s verses and compare them to modern language. The conflict between the group and the individual will be addressed through the all play. What happens when the bully becomes the bullied? What does it mean to be an outsider or to be part of a community? What does it mean to grow up? Do we tell our stories or do we let other people tell them for us? The concept underlying the creation of these plays is to introduce young people to the main themes covered in Shakespeare’s Coriolanus. Our intent is to create a story that mirrors the Bard’s one while taking place in a modern context. 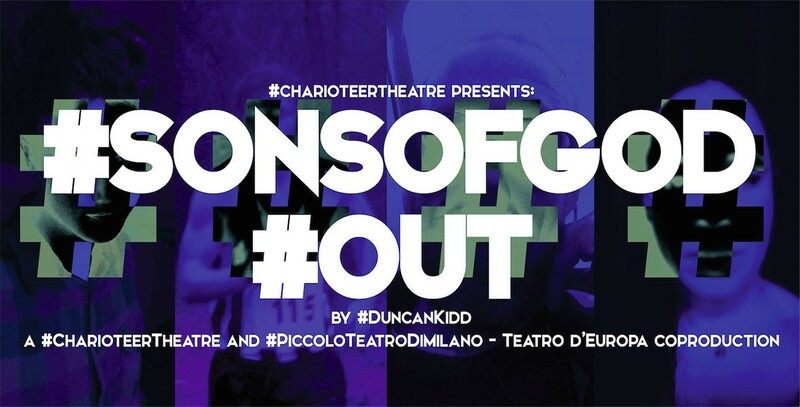 To realize the #SonsOfGod project, Charioteer Theatre engaged Jen McGregor and Duncan Kidd two young Scottish playwrights whose task was to transfer the story of Coriolanus to the present day. Their challenge was to find a way to communicate to the public the relevance of Shakespeare’s themes and matters. The tragedy of Coriolanus is one of Shakespeare’s less performed plays. Perhaps Coriolanus’ narrative appears to be far from our time and the monologues seem long-winded. The text reflects indeed the means of expression and the language at that time whereas nowadays, as a result of social media and new communicative needs, we grew accustomed to a more efficient and incisive language. Suffice it to say that we can only use 140 characters for a Tweet and texting abbreviations are used in everyday language.